It was only January when Asus unveiled its first three ZenFone handsets, but the company is already talking about plans for their successors. Asustek CEO Jerry Shen told investors on August 13 that work on the ZenFone 2 line is well underway, according to Focus Taiwan. Apparently the ZenFone has done surprisingly well, but the ZenFone 2 will feature an improved design and upgraded camera specs, memory, battery life and user interface. 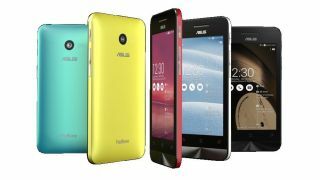 All but one of these new phones will feature 4G LTE, while the single 3G model will likely carry the lowest price tag. The ZenFone 2 could launch as soon as CES 2015, according to Shen. But that's not the extent of Asus' plans; the company is also working on another Android Wear smartwatch despite the fact its first one has yet to see the light of day. Shen told investors on August 12 the second Asus smartwatch won't debut for some time due to lack of market demand for wearables, but that Google has so far been impressed with what the company has come up with. Rumor had it the first Asus smartwatch would arrive later but cheaper than its rivals, and Shen said it might launch at IFA 2014 in September.